Fiddler's Green had its origins in 18th century sailing lore. Common seamen, who repaired their lines with a splicing tool called a fid, dreamed of a sailor's heaven, where after the long voyage their every desire would be fulfilled. 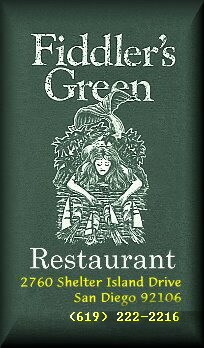 Today, Steve & Debi of Point Loma and their friends welcome you to their own Fiddler's Green where the best food and drink, and perhaps a touch of merriment, are offered nightly in one of the world's most renowned sailing ports. We hope you join us here as often as your voyages allow.